I believe that demographics explains two-thirds of everything and with more observers, analysts, and pundits also appreciating the explanatory power of demographics, the use of demography to account for economic, fiscal, and social phenomena has increased dramatically. That also means there are more inaccurate or misleading demographic analyses to sort through to find real insights. 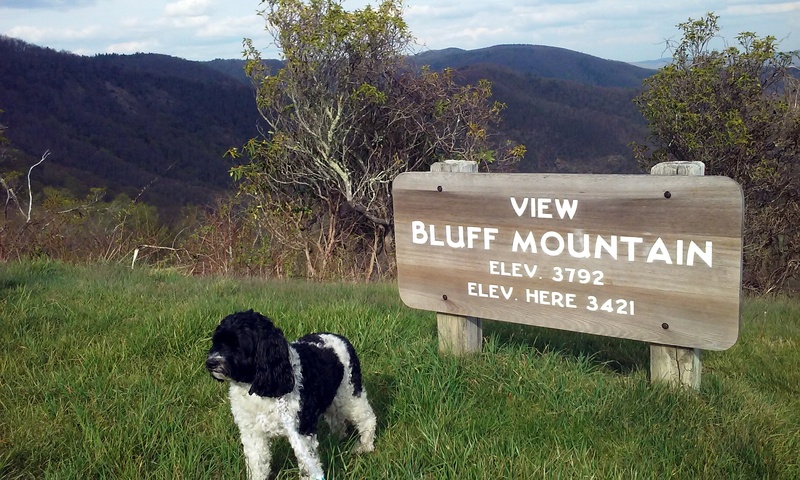 The simple story about how NH is aging rapidly is a nice, if not completely accurate, dramatic story with intuitive appeal that makes it ideal for stimulating PowerPoint presentations as well as marketing and promoting a host of public policies and causes. Most of the policy prescriptions justified on the basis of demographics will have no impact on the age structure of NH or any other state. As I have noted before, aging is a permanent, irreversible consequence of low average family size and longer life expectancies in developed societies. 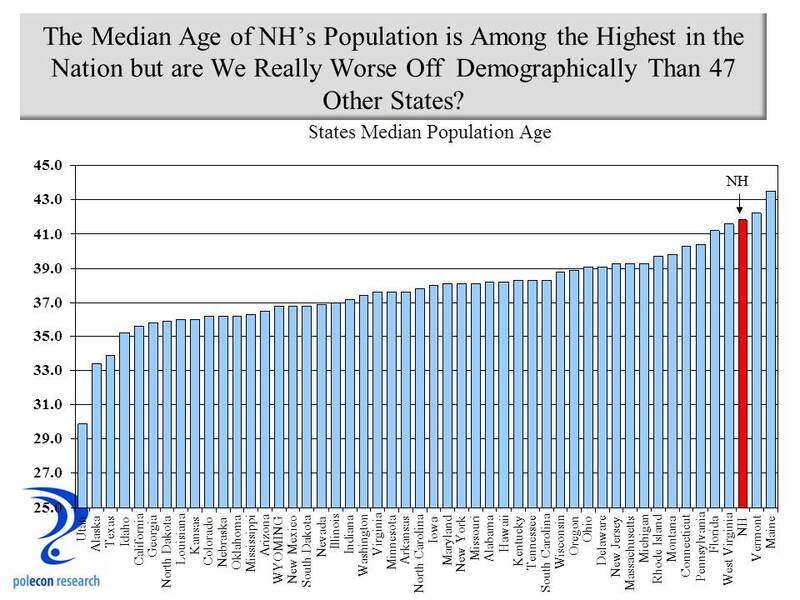 Unlike some states NH’s aging is more a result of its successes than of its failures. 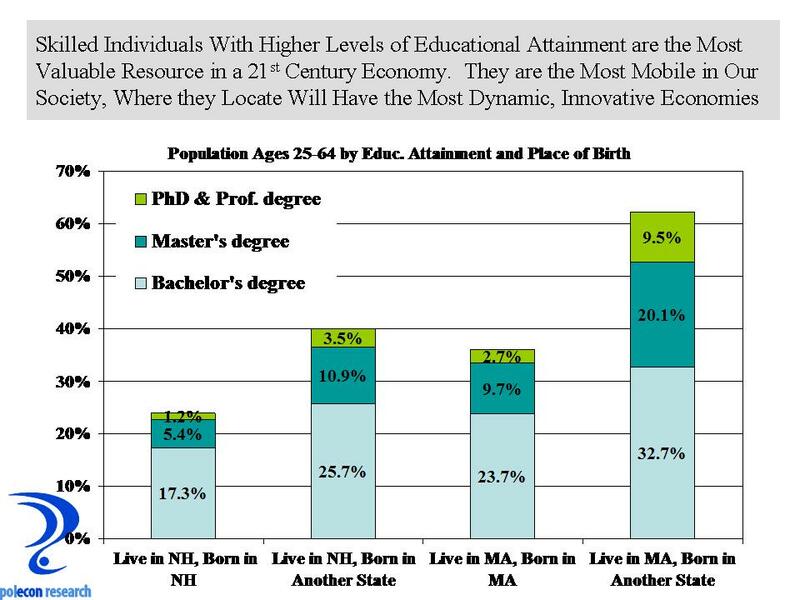 As long as NH continues to have relatively healthier and wealthier (lowering mortality rates) older citizens who resist shedding their mortal coil in a timely manner, and as long as females in the state continue their preference for achieving relatively high levels of educational attainment and labor force participation (lowering birth rates), NH will have a relatively higher median age of its residents. The youngest states (by median age) in the nation are those with higher birth rates i.e. Utah, California, Texas. Adding population at age zero has the greatest impact and over the longest time on the age structure of a population. It is possible for NH to achieve a relatively stationary median age through in-migration; even if the in-migration isn’t concentrated among the youngest age groups (this can be demonstrated mathematically but is not amenable to a blog post). 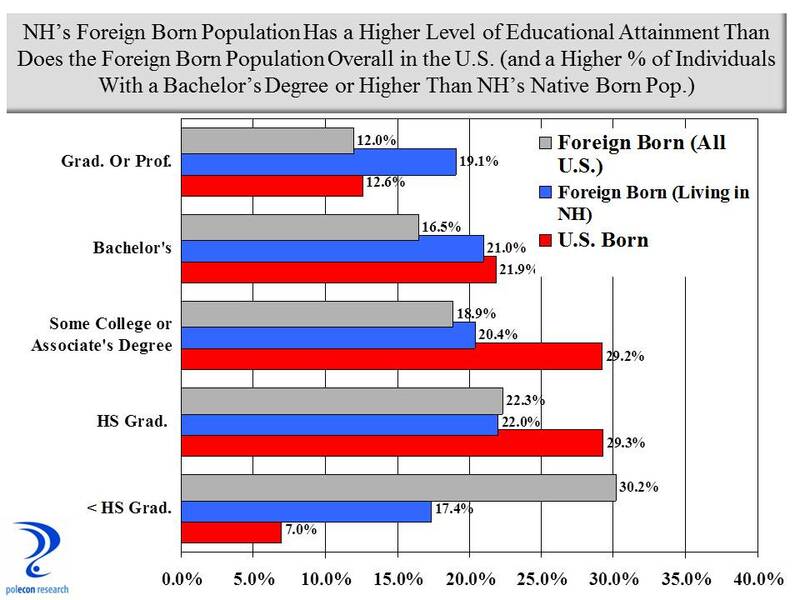 In fact, that is exactly what New Hampshire did for several decades during its boom years – it added a lot of individuals and families in the middle of the age distribution (30-44), typically two wage earner married couple families (probably both college educated) with children. I think it is great, although somewhat unrealistic, to think NH can retain all of its young people in an effort to address the “aging” issue (young people from smaller states and non-metro areas seem to have an understandable preference for locating in areas teeming with a similar demographic). 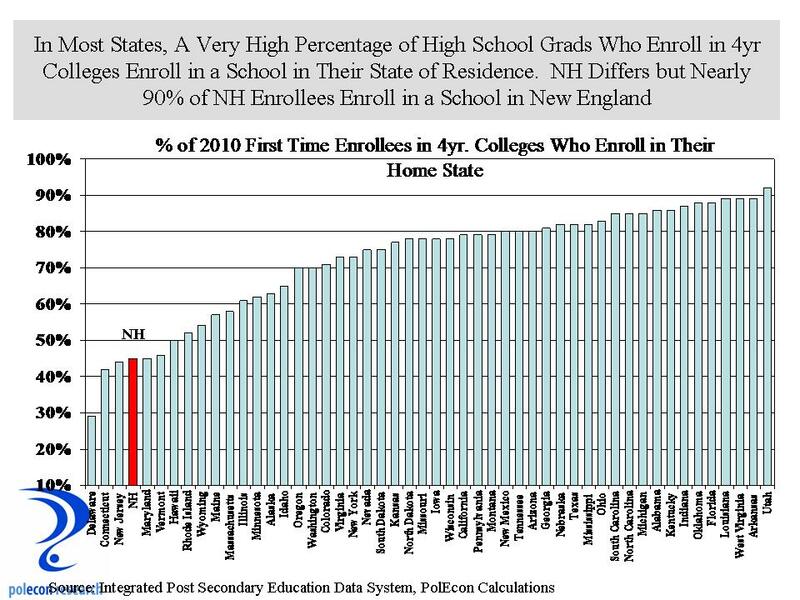 Even if NH keeps all of its young people in-state after completing their education I don’t think there is anything we can do to keep them from growing older, so as long fertility rates continue to decline the state will only be keeping a somewhat larger percentage of a declining demographic. But that is not to say that efforts to make the state more attractive to young people aren’t valuable, whether or not they are directed at individuals born in New Hampshire. 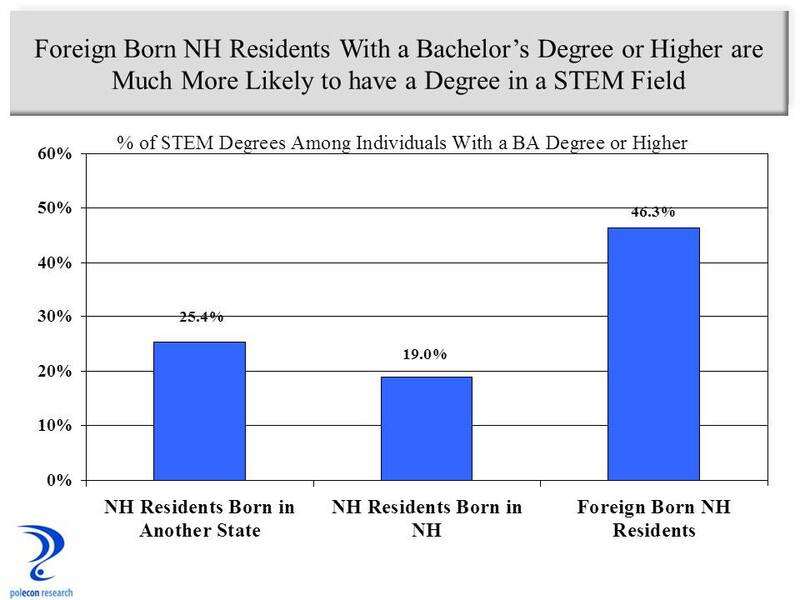 In fact, NH should be more concerned with making the state attractive to the skilled individuals with higher levels of educational attainment, of all ages. 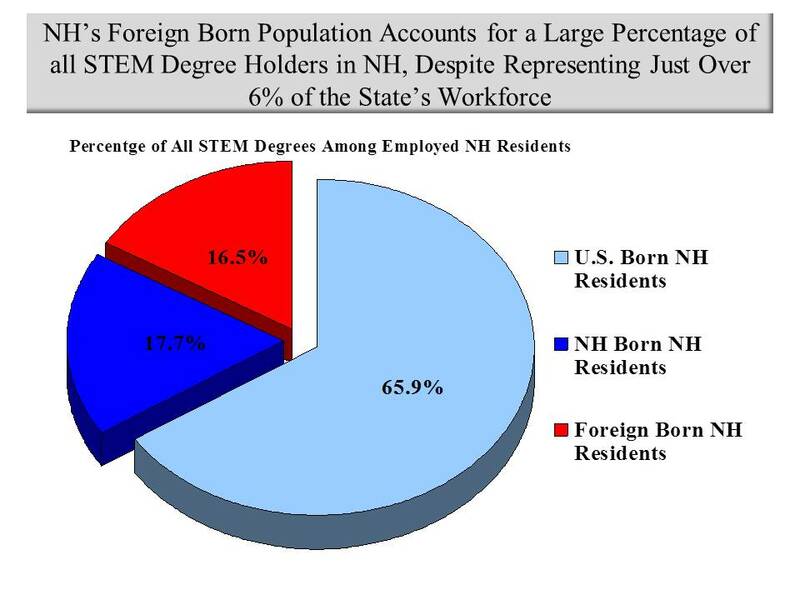 Our state’s ability to attract ‘talent” from other states has largely been responsible for NH’s increasing prosperity over the past several decades and that gets to the demographic trend NH should be very concerned with – the continuing decline in our nation’s mobility or rate of inter-state migration. The recent decline has been attributed to economic conditions but there is a longer-term trend decline in inter-state migration that has been widespread across demographic and socioeconomic groups, as well as for moves of all distances. 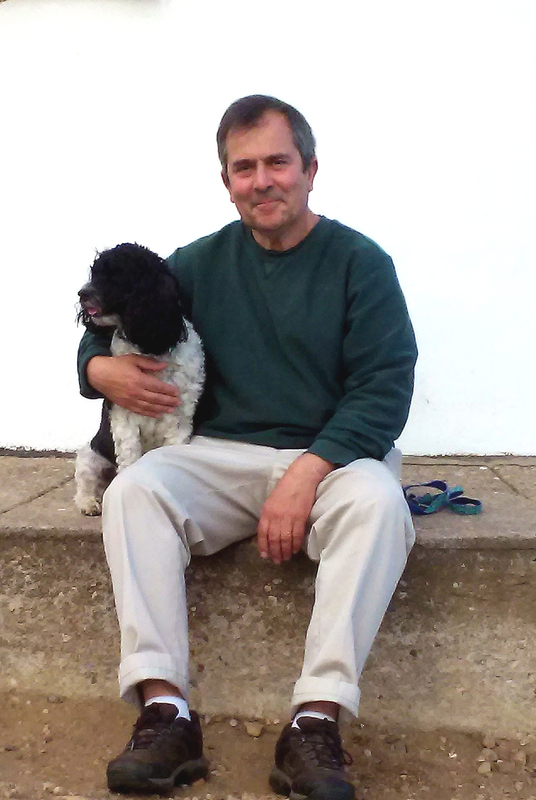 Researchers have noted that homeownership and the age distribution of the population (older households move less) can account for some, but not much of the decline, and some have hypothesized that changes in the labor market (reduced job changing and switching of employers) may be playing a significant role. 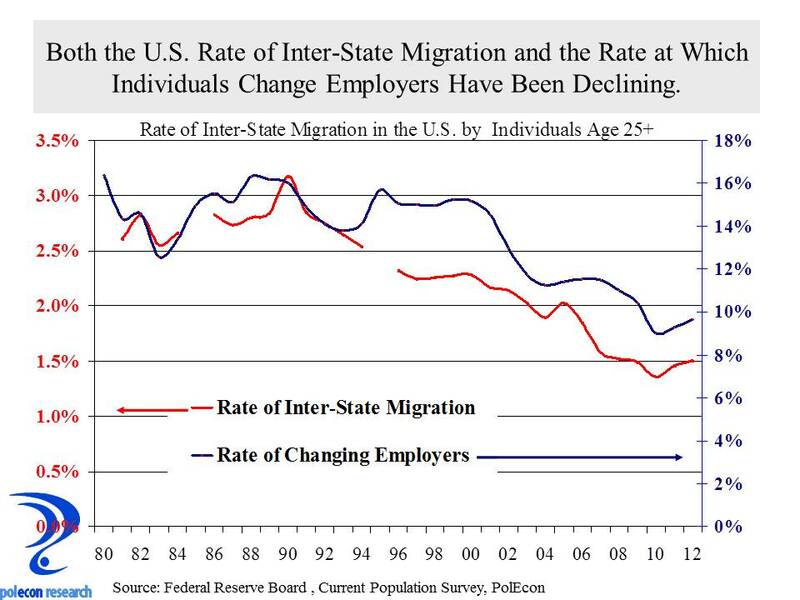 The chart above shows that both inter-state migration and individual rates of changing employers have been declining. While not indicative of causation, there is a strong correlation between the two variables over time. 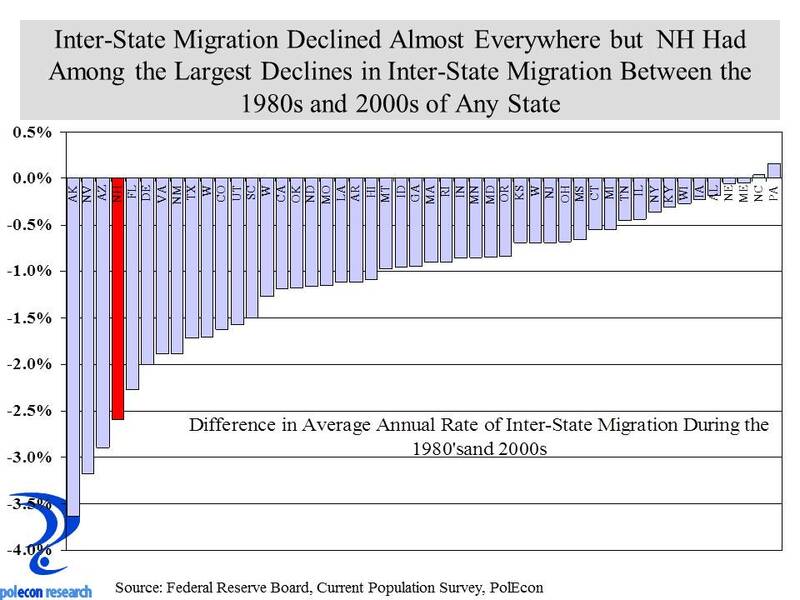 NH has seen a larger drop in its annual inter-state migration rate between the decade of the 1980s and the decade of the 2000s than almost all other states. Of course some of that is attributable to the fact that we began with much higher rates (see the drop in other states with high rates of inter-state migration) but it is still an important trend to examine. Examining the relationship between inter-state migration and switching employers with cross-sectional (state level) rather than as a time series, shows a similarly strong relationship, suggesting to me that a more dynamic labor market where individuals are less concerned about moving between employers will maximize NH’s opportunity to increase the net in-migration. 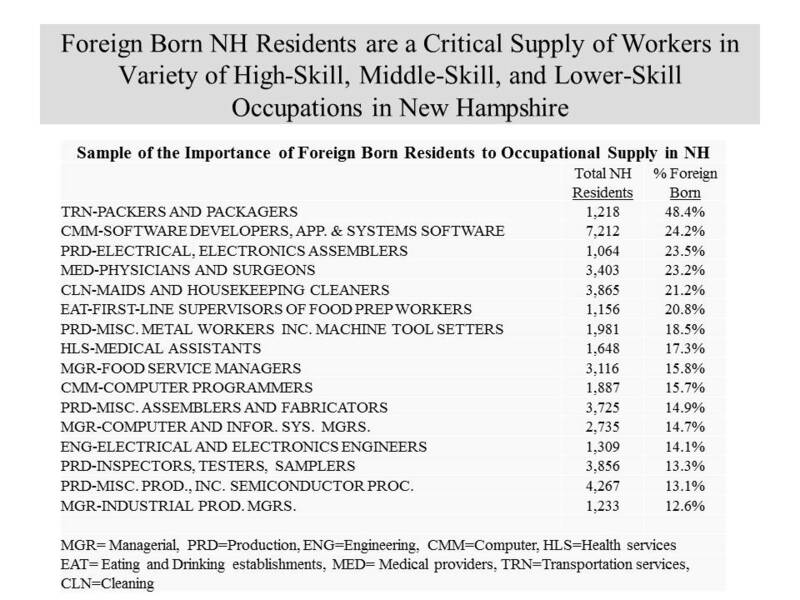 Still, developing a simple predictive model that includes rates of switching employers to explain inter-state migration rates suggests that NH should have seen a much smaller decline in net-migration than actually occurred. 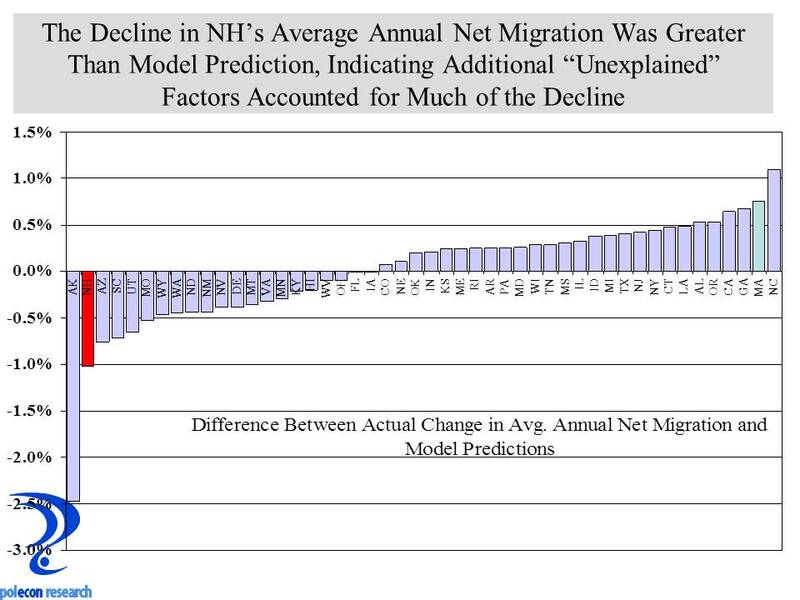 The chart below shows the model’s residuals, or errors in predicting the change in inter-state migration for each state, it shows that NH’s decline in average annual inter-state-migration between the 1980s and 2000s was actually greater than predicted by the model. At the other end of the spectrum, Massachusetts, while having a declining inter-state migration rate, experienced a much smaller decline than predicted. 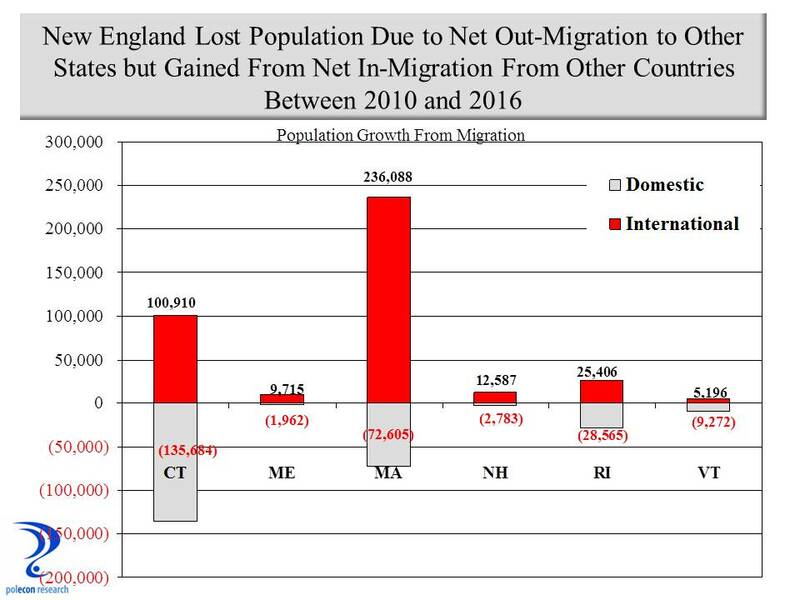 A lot of self-serving hypothesis for the above expected decline in NH’s inter-state migration rate will be offered but understanding the real causes are critical for the state’s future. New Hampshire needs to concerned with demographic trends but it also needs to be concerned with the right ones and the ones that it has some ability to influence. I don’t think the state can or perhaps even should do much about its lower birth and certainly not the lower mortality rates that are key drivers of population aging. But I do think that achieving a relatively stationary (it will increase it is just a matter of how rapidly) median age is possible. But this will require policies that are concerned with making NH attractive to individuals as well as businesses. At the local level this is working as evidenced by the differences in growth rates among NH regions, but as the data in this blog suggest, in doing so the state will be pushing against larger national economic and demographic trends.